Heavy rain (total 20mm), heaviest during Sun night. Mild temperatures (max 5°C on Mon night, min 1°C on Sat night). Winds decreasing (fresh winds from the W on Sat night, calm by Mon afternoon). Heavy rain (total 56mm), heaviest during Thu night. Mild temperatures (max 8°C on Tue morning, min 3°C on Fri morning). Wind will be generally light. 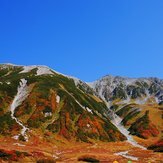 This table gives the weather forecast for Tateyama or Tate-yama at the specific elevation of 2500 m. Our advanced weather models allow us to provide distinct weather forecasts for several elevations of Tateyama or Tate-yama. To see the weather forecasts for the other elevations, use the tab navigation above the table. For a wider overview of the weather, consult the Weather Map of Japan.